In an age of irony, Freitag bags shoulder it all. Respectable, credible, authentic, genuine, trustworthy, and honest, they are an urban tool, a saddlebag for the city cowboy, a messenger bag for the real and the virtual; durable enough to be carried all over the world. 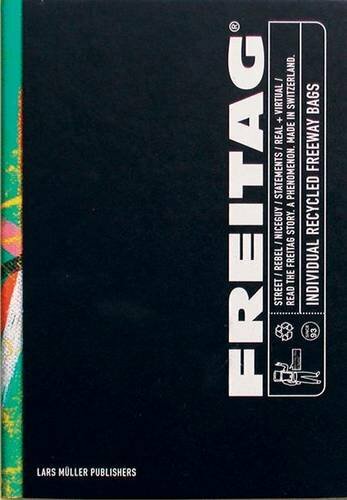 Invented by Swiss brothers Daniel and Markus Freitag, who wanted bags just like the ones worn by New York bike couriers, bags that were practical, weatherproof, quick, and easy, the Freitag bag is tailor-made on a small-scale of recycled truck tarpaulins, bicycle inner tubes, and car seatbelts. In line with the Freitag principle, each book is individually bound with a spine made of typical bag material, and it holds a grab bag of printed goodies. In addition to covering the history of the bag and its particular ecological, economic, and sociocultural contexts, Freitag contains portraits of 3000 Freitag bags and their owners, most of whom are members of a generation that is as vain as it is critical of consumerism -- a generation for whom the Freitag bag is the ideal brand-name product.